Six months ago I found myself in an elevator on my way to the 35th floor to request advice from Rich, a top litigation attorney and a partner at of one of the most prestigious law firms in the country. With each monotonous beep indicating I was creeping closer to my destination I mentally rehearsed how I would introduce him to the facts and to my plan of action. This proposal was the executive milestone that could save my startup: firing my cofounder. Like any founder who finds himself in this situation, I saw the early signs but was hesitant to take immediate action, reluctant to spend valuable company time on an unpleasant but necessary task. But that process is precisely where I found myself today, being led swiftly by Rich’s executive assistant to a large conference room overlooking Wall St and the Hudson. 8:55am. The past year was a draining mental experience. It felt as if one day I woke up with a sensitive tooth and the next I was in dire need of a root canal. Six months into our partnership I finally came to terms with the fact that I’d made a mistake. I’d invited an acquaintance to join my venture as a cofounder, who consistently misrepresented the truth and lacked competence in most of the areas that he claimed to have expertise. His LinkedIn profile was more of a wish-list, and his incompetence was taking a toll on my platform development, my fundraising efforts, my board of advisors and, most importantly, my personal sanity. At nine o’clock Rich sat down at the opposite end of the conference table. We greeted each other, made pleasantries and dove straight into business while he opened his yogurt, poured in some granola and scooped up a hefty spoon full. So, how can I help you Ricardo? I began the same way that I typically introduce my startup to prospective investors and mentors. I started with my professional background, described the catalyst for creating the product and explained the goal that led me to launch the startup – revolutionizing the way political fundraising is done in this country. Then I proceeded to delineate the reasons why it was necessary to take action and, finally, suggested the strategy that I thought was most appropriate. and you are the majority equity holder? – “OK, so just fire him” he said, and just as matter of factly picked up his spoon again and casually dunked it in his yogurt. Although there were additional details that made it slightly more complicated (vesting and majority vote clauses, among them) Rich had made his most valuable contribution just seven minutes into our meeting. He put things into perspective. I felt like a five year old on my way back from the sandbox after unloading my troubles on a grown-up. The next hour was spent reviewing my formation documents and stockholders agreement, answering Rich’s questions and, finally, arriving at a plan of action. To my pleasant surprise, the plan of action I had so carefully rehearsed in the elevator was the best one to implement. Rich’s pro-bono counsel was critical and his blessing provided me with the confidence that I needed to move forward. He was also a critical source of support in building procedural buttresses and suggesting reactions to the most probable of scenarios. That morning I learned that, beyond the legal preparation (and over-preparation), this was primarily a matter of rolling up my sleeves and executing. I was ready to address my issue head on. A month later, thanks to the guidance and support of my board of advisors as well as the founders of my accelerator (ERA), my cofounder was removed and, almost immediately, the future began to look brighter. I reclaimed my sleep cycle, the product was launched, and candidates who began using the platform were raving about it. The startup fundraising efforts were reignited and the product began to flourish. My startup was able to reclaim a chance at another day and test itself against the market. Executive team and capitalization table re-orgs are not easy undertakings but often the only recourse to get a company in order. Initially it was difficult to decide on the best time to deploy the process. However, as time went by, my waning tolerance level made it very clear that it needed to happen very soon and definitely before the company prospects increased and the stakes grew higher. During D-Day you have to roll up your sleeves and your pant legs as high as you can and pack food for the road because it’s unclear how thick the mud you’ll tread will be and how long you will find yourself carrying your company on your own shoulders. However, don’t lose sight of the most exciting part of journey. Although you wouldn’t willingly be in this situation if you didn’t fully believe in your product, there is no real certainty in it. 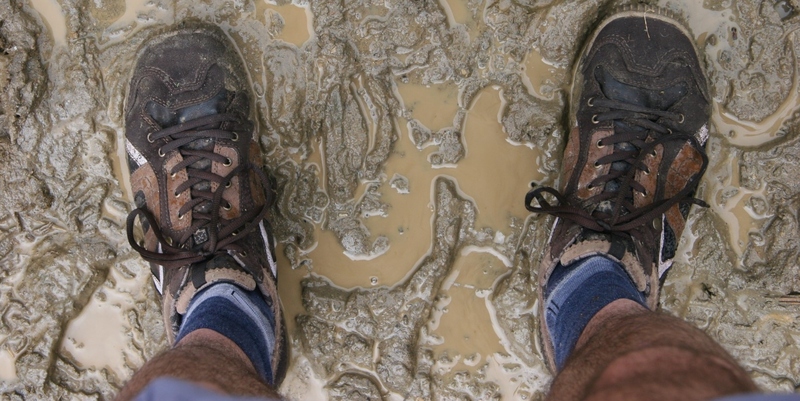 In hindsight, you might find yourself recalling a beaten down, lethargic version of yourself, trekking through knee-high mud carrying a bag of bricks. Or, you might remember a more romantic version of the scenario, fit, persistent, carrying an early prototype of something great. Regardless, when the treacherous trip is itself what you enjoy and take pride in, the subsequent value of the product is merely icing on the cake.